Wes had a men’s club meeting, so I met Bonnie, Paul and Katie at the 3rd Thursday food trucks. For the past couple of months, I’ve been eating at the Mexican truck, but last night I branched out. 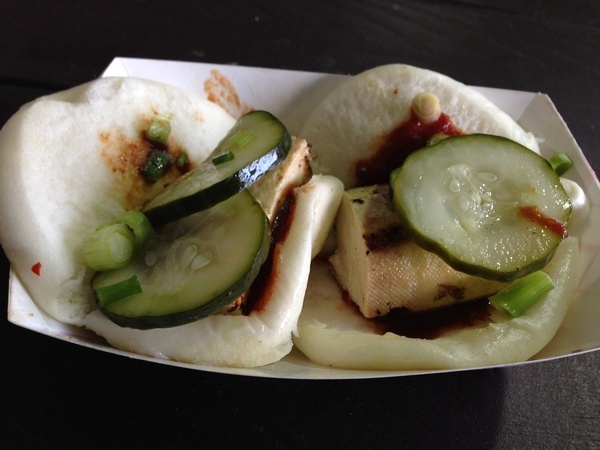 Pictured above are steamed buns from the YumYum truck. There’s a choice of pork, chicken or tofu as a protein (mine was tofu) and they were absolutely delicious. The buns are light and airy, the tofu is seasoned perfectly and the there’s enough “heat” to make it really tasty. I may have found a new obsession. Bonnie and I also split an order of truffle oil flavored macaroni and cheese which was also yummy. We visited with friends for a while and then went to Mickey’s Igloo for ice cream desserts, figuring they’re closing soon, so we have to eat enough ice cream to last us until the spring.